Construction of the mill at Port Mellon began in 1908. The site was chosen primarily because it was on the banks of the Rainy River, and most importantly, its water rights had been secured by Vancouver's Cates family. The Cates had purchased two 160 - acre parcels of land around the river in 1891. Originally, it was the prospect of gold in the river that had attracted their attention. In 1907 the Cates family sold 85 acres of their land to the newly formed British Canadian Wood Pulp and Paper Company. A year later construction of the first mill at Port Mellon, which would be named Pioneer Mills, began under the watchful eye of Captain Henry Augustus Mellon. On October 14, 1909 at 2:30 pm the first piece of paper rolled off the No. 1 pulp machine - a sample was collected for the Vancouver Archives and for the company's board room. For the next four months, Pioneer Mills produced quality wrapping paper for the Vancouver market. Unfortunately the demand for such paper was not as high as expected and shipping the paper to other cities proved to be very expensive. The mill continually lost money until it was closed in early in 1910. 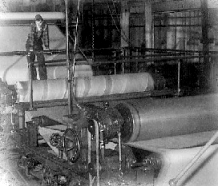 For the next 40 years the mill at Port Mellon would ride the waves of world pulp demand - operating when demand was high and shutting down during the lean periods. This pattern continued until the mill was bought by the Sorg Paper Company in 1940. With the outbreak of World War II, the mill at Port Mellon was given a new lease on life by the Sorg Paper Company. For the next nine years, the mill produced much needed pulp and even launched an improvement project - which was no easy task considering the number of men going overseas to join the war efforts. Sorg accomplished this by buying used equipment, including a No. 3 machine that was originally built in 1910 for an Illinois company. By 1942, the shortage of manpower had become acute at Port Mellon. For the first time, women were employed in key positions such as screen-tenders, boiler-room operators, chemical and pulp testers. 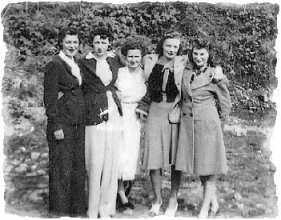 Soon there were 40 women working and they continued to work until the war ended in 1945.